AlcoStop detects the alcohol level of the persons & prevents them from driving..!! There is a greater need to prevent accidents caused due to drunk driving. 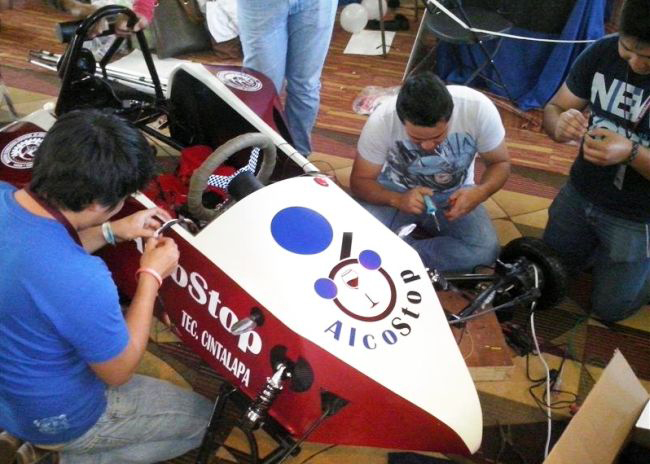 So, the students at the Institute of Technology of Cintalapa in Mexico developed a mechanism. It detects the blood alcohol level of a person. An advanced system called AlcoStop which acts as a deterrent has been developed as an active automotive safety system. It senses the alcohol on a person by sniffing the driver’s sweat and prevents him/her from driving. The system consists of various sensors fitted on the steering wheel, the gear shift lever and seat which can detect through sweat if the driver has high intoxication levels. If the result is positive, it disables the engine, which prevents the drunk driver from driving. It also features a Global Positioning System (GPS) tracking unit that can monitor it in real time. In addition, the system traces the alcohol on the driver. If the system does not detect alcohol, the car will start. But if the driver is intoxicated, the system renders the car immobile. They also developed a mobile app. It sends a distress signal to the family or friend along with the location of the vehicle. Thus, it informs them when the system disables the car. It means that someone needs to go to pick up the driver. According to makers of AlcoStop, the system is economical and easy to use as anyone can install it. It is just like a car alarm which they designed for detecting alcohol. Home » Articles » AlcoStop: Drink & Drive? Not Anymore..!